Our first gig for 2018 was by invitation of the Gerrigong Music Club. One of their members had seen us perform at the Kiama Jazz Festival and they were keen to get us along to do a private concert! 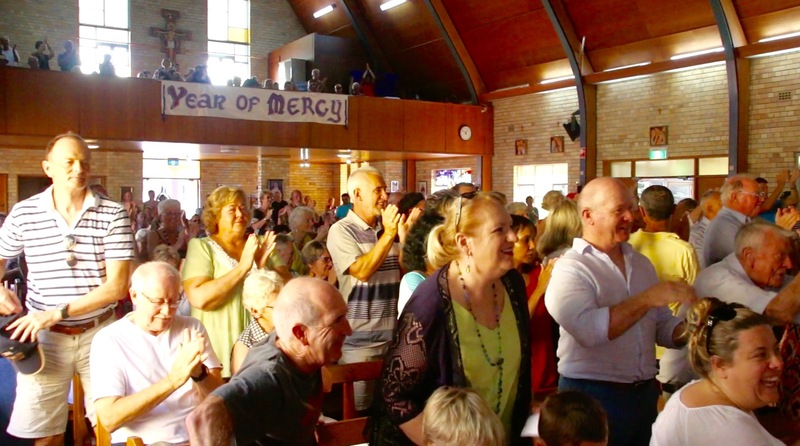 The concert was held at the Gerrigong Town Hall on a warm summer afternoon to a packed room. Songs included People Get Ready, Peace in the Valley, Let the Fire Burn, I Am Ready, Hallelujah and Didn't it Rain - spookily enough the dry spell broke that very evening! In May, The Honeybees were invited to perform for the weather segment of Channel 7's Sunrise show. 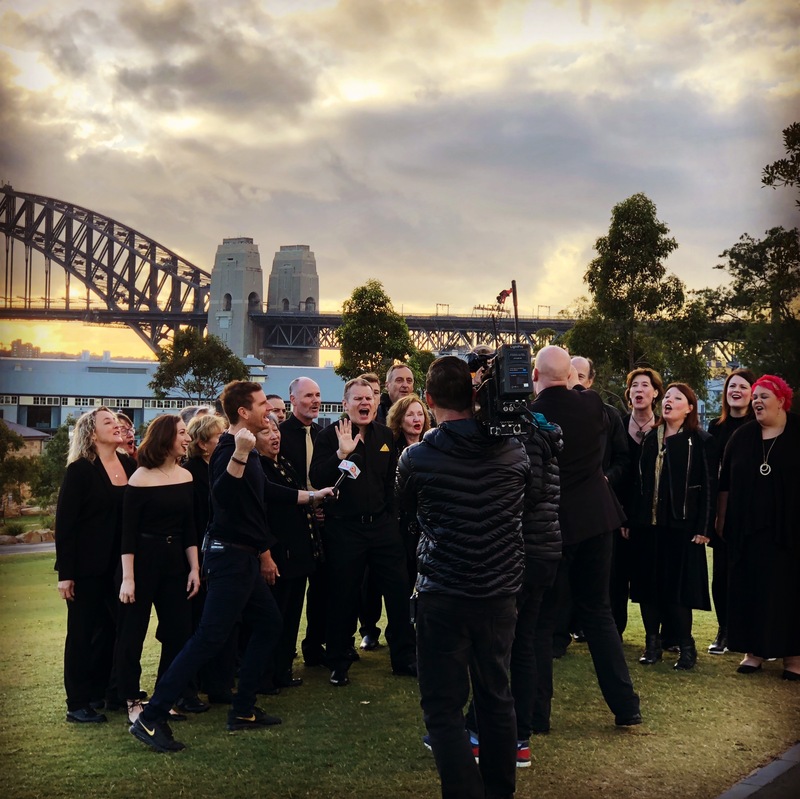 Early on a beautfully crisp winter morning we assembled at Barangaroo to sing live snippets of Didn't it Rain & Oh Happy Day. We were also asked at short notice (10 minutes) to learn and perform The Spice Girl's' classic Wannabe, which was on the back of a tenous link/rumour that they were due to perfrom at the Royal Wedding of Harry & Meghan the following day (they didn't!) You can have a peek at the video here. Early June saw The Bees perfrom at the Ceremony of Remembrance for those wishing to honour and remember the important people in their lives who have died, are dying or are lost to them. This service offered solace through sharing experiences of grief. The Honeybees were an integral part of the event, bringing our own gentle magic to the day. 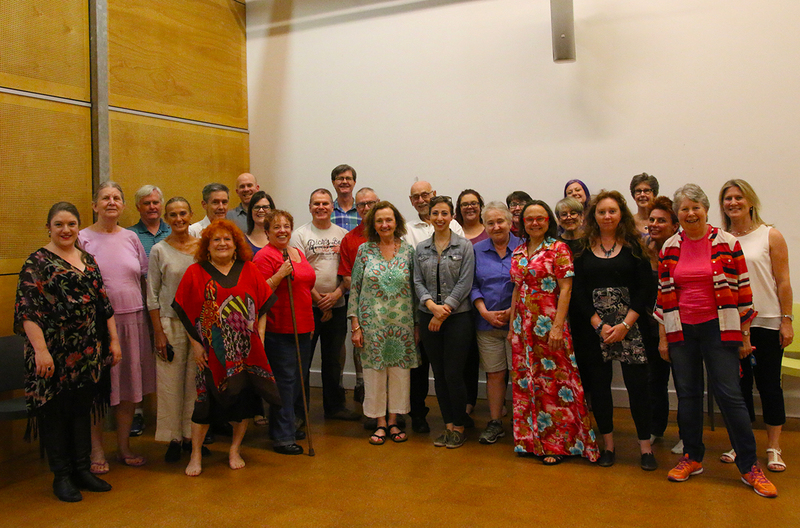 Our June Winter Soulstice was once again held at St Mary Magdalene Catholic Church in Rose Bay. Proceeds from the concert went to Rural Aid Australia . 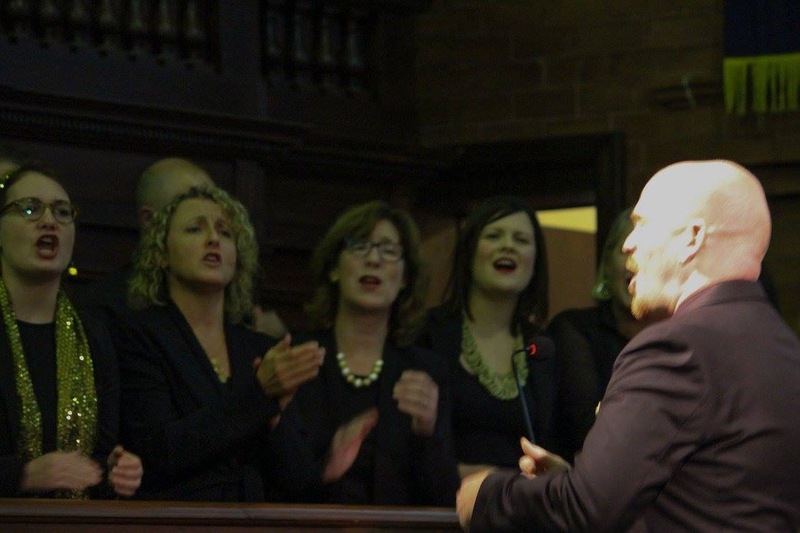 Towards the end of August we were delighted to perform with Cafe of the Gate of Salvation at an event very dear to our hearts - the farewell of Wayside Chapel's outgoing CEO and Pastor Graham Long. Held at the Sydney Masonic Centre, this service also served to welcome new CEO/Pastor Jon Owen. The recently deposed Prime Minister Malcolm Turnbull gave a moving speech as did a number of guests, including the Wayside Chairman, Ian Martin. 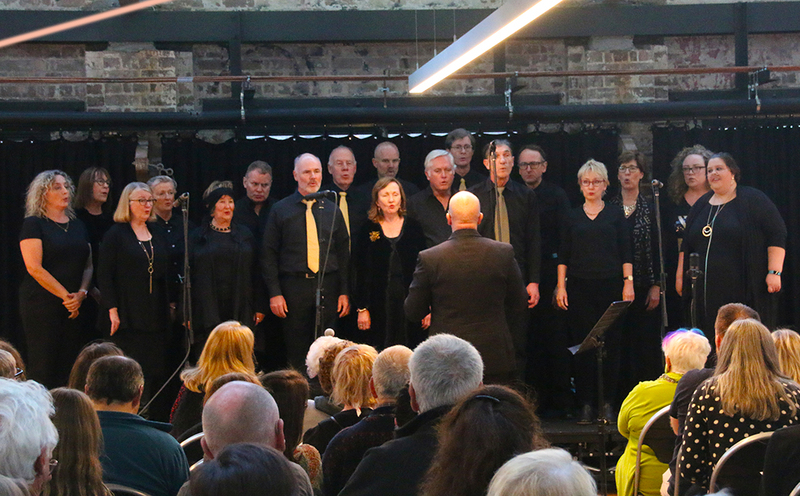 Mid-September saw The Bees perform a short set at the Stairwell to Heaven 20th birthday fundraising concert in Glebe. 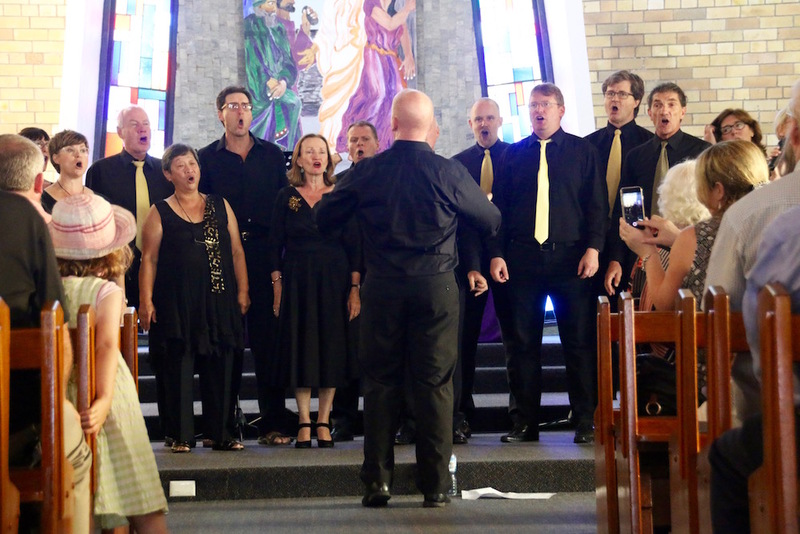 Proceeds of the concert were donated to Elsie's Women's Refuge, Glebe. Our Summer Concert in 2018 was once againa held at Syney Boys' High School, Moore park. Proceeds from the concert will be donated to Gunawirra Young Aboriginal Mothers Program. Gunawirra is a not-for-profit organisation which provides support for young Aboriginal women and teenagers through the crucial first five years of their child’s life. We sang a number of new songs but highlights included Revelation, Peace be Still, Lift Every Voice & Sing and Bura Fera. The 250 or so strong audience not only provided us with a great atmosphere but thanks to them we were able to raise $6,000. Our final performance of the year was a Christmas affair on the steps of St Mary's Cathedral for The Lights of Christmas. We did two sets, each of about 6 songs including Oh Happy Day, Revelation (to much applause) Walk in the Light & Glory Manger. After our performance the light show began with an animated Christimas story projected on to the face of the cathedral. Our first gig for 2017 was at the Kiama Jazz Festival. On a lovely & sunny March afternoon we made the most of a less than ideal location on the main strip to battle with nearby amplified guitars and drums but we held our own! We set up outside an old church and sang a set of 10 songs including Richard's 'go for it' version of Never Let Go My Hand. The following day we performed 9 songs at the ecumenical Kiama Jazz Festival Gospel Concert at Ss Peter & Paul's Catholic Church. We stuck to those songs we know and love the best such as Storm is Passing Over, Precious Lord and People Get Ready. The 400 or so audience members got into the spirit and brought out the best in us. 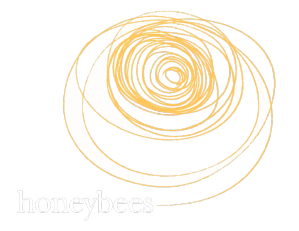 We also sold over 20 of our Milk & Honey CDs, donating $5 from each sale to Médecins Sans Frontières, who were the concert's chosen beneficiaries. Our 25th June Winter Soulstice was held at St Mary Magdalene Catholic Church in Rose Bay. Proceeds from the concert went to Orange Sky Laundry who are the world’s first free mobile laundry service for people experiencing homelessness. With an aim to improve hygiene standards and restore dignity to people doing it tough. In August, the Honeybees, together with Unaccompanied Baggage, performed at the Willoughby Uniting Church for Acappella Northside 2017. This year, Acappella Northside was raising money for two causes. The first, Narrandera Uniting Church, is a church in a small rural community that can't often afford a full-time minister. To assist, three Sydney congregations (Crows Nest, Hornsby and Willoughby Uniting Churches), contribute to the cost of having a minister of Narrandera Uniting Church. The other charity is the Asylum Seekers Centre, Newtown who provide practical and personal support for people seeking asylum living in the community. The Honeybees performed some of the favourites such as Didn't It Rain, I am Ready, Let the Fire Burn and Oh Happy Day. In addition to these, Torie debuted as a soloist, and beautifully performed Joyful Joyful to rousing applause. We held our Gospel Groove Workshop in late November, once again at The Wayside Chapel Hall. It's always a great event where participents learn about the history of gospel music and its linkages with the slave trade. The 20 or so participants also got to learn some songs and this year they were Let's Go, This Little Light of Mine, Thank You Lord & Shine on me. A number of the 'Gospel Groovers' joined us on stage a few weeks later at the Summer Concert to perform these pieces. Gospel Groove Graduates - 2017! December saw another very well attended Summer Concert at Sydney Boys High School. The cabaret style evenings saw The Bees revisit some old songs and also perform a few new numbers. The repertoire included 'oldies' such as Didn't Rain, How I Got Over, People Get Ready & Love & Joy, augmenetd by new numbers such as At a Time Like This & Joyful Joyful. With the death of Leonard Cohen in late 2016, we chose to add Hallelujah to our repertoire and this was the hit of the evening. We raised over $5,000 for our chosen charity Twenty10 - a group that provides a broad range of specialised services for young people 12-25 including housing, mental health, counselling and social support. It really is a great cause doing wonderful work, especially after the turmoil of the postal plebiscite a few months earlier. 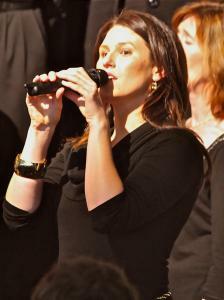 Our final event of the year was a City of Sydney Christmas singing event in Martin Place. We sang four sets of 5-7 songs as people were heading home or doing their Christmas shopping. Most people stopped and enjoyed a full set which was great to see. Many phones were recording and we could see people really getting into the Christmas spirit. Our first gig for 2016 was one very dear to our hearts as it was the wedding of choir member Maureen to her dashing partner Mark. The beautiful ceremony was held at Banjo Paterson's Cottage in Gladesville. In mid-March the Bees travelled down the coast to take part in the Kiama Jazz & Blues Festival. Together with The Parson Sons Plus Gospel Band, we performed at the Sunday morning Gospel Jazz Service with a set of 9 songs including I Am Ready, Trouble of this World & a rousing encore of How I Got Over. Of particular note was the fantastically involved audience who did not hold back on joining in and showing their apprecaition. One of the organisers posted the following in our guest book : "Wow! Thank you so much for such a beautiful celebration in song today at The Kiama Jazz Festival. The harmonies were exquisite and the soloists were so uplifting. I have had so many amazing comments about the performance." Early June saw a first for The Bees - an ordination! 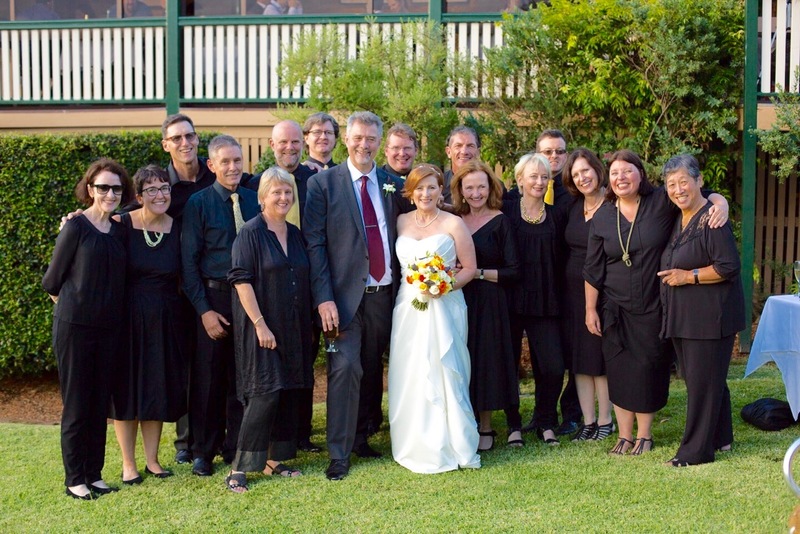 We were delighted to perform at Vanessa's Ordination Ceremony at the Koean Community Uniting Church in Lindfield. On a very stormy, wet and wild day in Sydney, we performed a number of songs that Vanessa chose, incluing Oh! Happy Day, Never Let Go My Hand & How I Got Over. Vanessa enthused "... Words cannot express my gratitude for what you did at my ordination. Thank you all so much...". 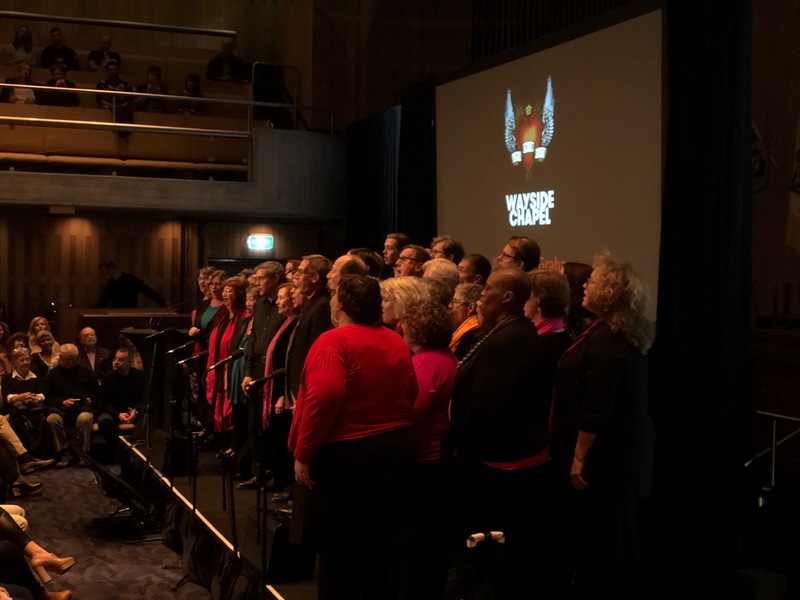 Late July saw a number of Bees travel to Taree to hold a workshop and perform at a fundraising concert for the Manning Valley Push for Palliative Care group. We held a workshop with about 20 locals during the day and performed in front of about 70 people that evening. A great time was had for a great cause. Thanls to ex-Bee Judy for organising. 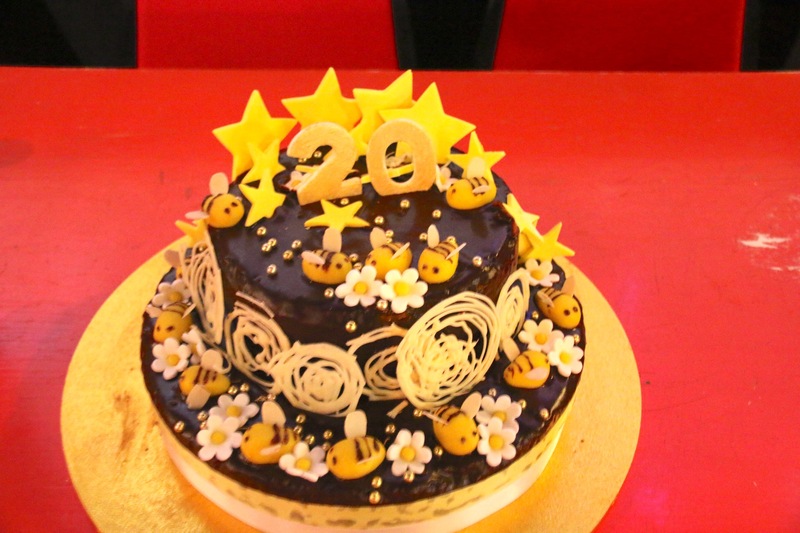 A special evening was held on Friday 16th of September for The Bees to celebrate our 20th birthday and to laucnh our first CD - Milk & Honey. 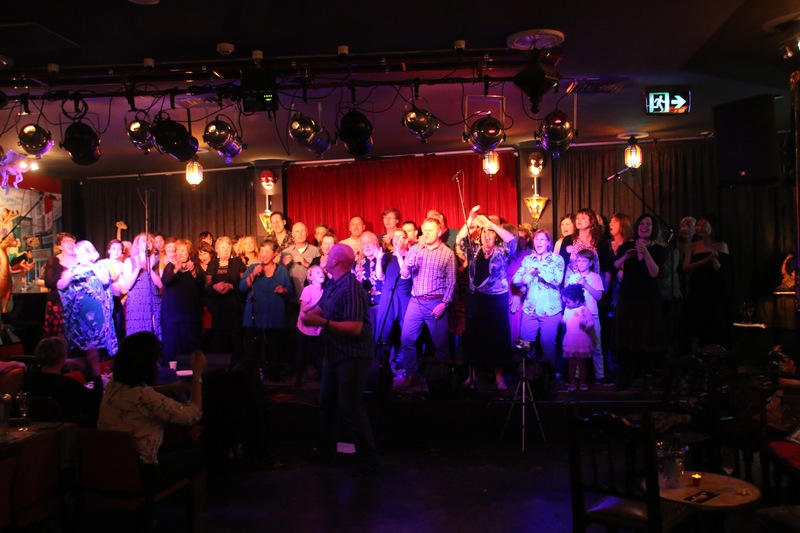 We hired The Camelot Lounge in Marrickville and about 90 Bees and ex Bees came along to help us celebrate this milestone. The evening held a few audio visual treats, two sets, a bit of dancing and lots of laughter and reflection on the history of this great group of people - past & present. We held our Gospel Groove Workshop in early November. It's always a great event where participents learn about the history of gospel music and its linkages with the slave trade. They also get to learn 4-5 songs and this year the songs included Come Along my Friend, This Little Light of Mine, Everytime I Feel the Spirit & Freedom is Coming. Some of the 'Gospel Groovers' joined us on stage a few weeks later at the Summer Concert to perform these pieces. Gospel Groove Graduates - 2016! December saw another sell-out summer concert at Sydney Boys High School. 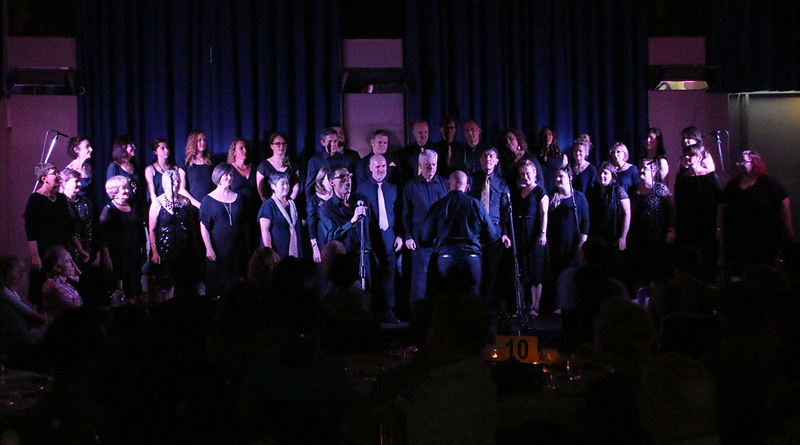 The cabaret style evenings saw The Bees revisit some old songs and also perform a few new numbers. The repertoire included Gotta Serve Sombody, Change in My Life, Oh! Happy Day, People Get Ready & I'll Fly Away. We had a number of Bee's making their debuts. We were able to raise over $4,000 for our chosen charity which was Lou's Place. Based in a King's Cross terrace house, Lou's Place is the only day-time refuge for women in Sydney where they can come and have a bite, a shower, pick up some clothes and importanly have a chat with somebody. It really is a great cause doing wonderful work. 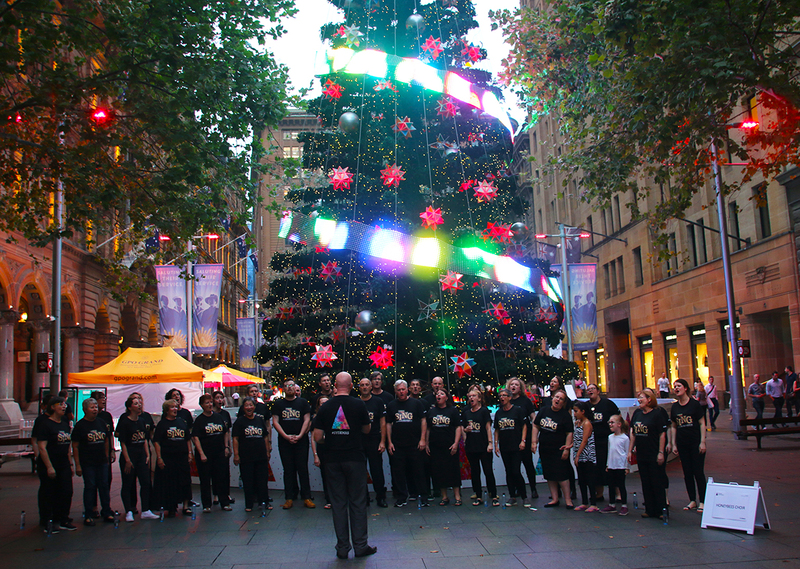 Our final event of the year was a City of Sydney Christmas singing event in Martin Place. We sang four sets of 5-7 songs as people were heading home or doing their Christmas shopping. Most people stopped and enjoyed the full set which was great to see. Many phones were recording and we could see people really getting into the Christmas spirit. Each set ended with our Christmas song Pretty Little Fingers.